ShopTab supports two-tiered category listings inside of our Facebook Shop application. The application is set up to default to a single tier of category listings unless designated with subcategories by the store operator via manual or automated product additions. Especially valuable for large product listing stores, a ShopTab client can designate an unlimited series of “parent to child” relationships to provide optimal navigation for their clients in Facebook. You have multiple options to add products in ShopTab via either via manual input of the product or a upload of a data file. Click on either the “Edit” button on a product in the My Products section of the admin site or select the Add Product option from the main menu. 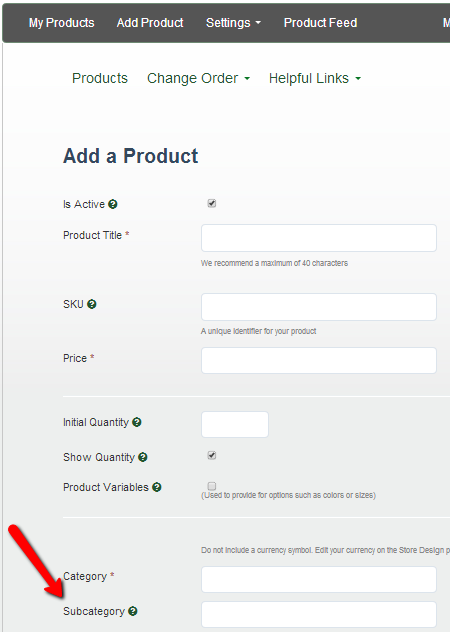 Once you have selected this option you will be presented with the manual input fields for your product. To create a subcategory, enter the category in the “subcategory” option highlighted below. Once you have added the Subcategory, select update to load your product. In a situation where you want to add a subcategory via a data file, the file format supports an additional column for these situations. As noted below, the “subcategory” title and column are added to the standard data file next to the “category” column. This new template is available on the Data Feed page of ShopTab Admin. This title and column are optional and do not have to be included with a data file when there is a single tier category situation.